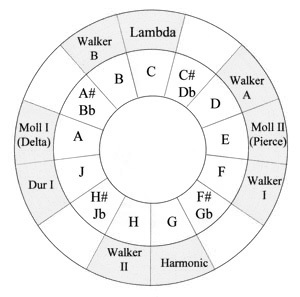 SuperCollider is an algorithmic music language that can be used to generate microtonal music. Here’s a quick example of random Bohlen-Pierce notes. Using a sampled A=440Hz piano note, I squished and stretched it to play a BP chromatic scale. 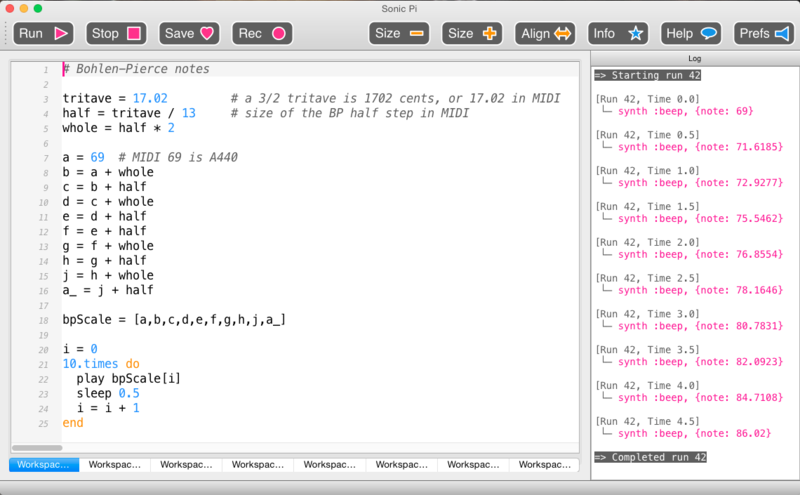 Here it is juxtaposed against random MIDI BP notes using the Sonic Pi’s FM synth. Way back in 1991, I produced an album of algorithmic music. It has recently been re-released by Fixture Records. Renewed interest in the project sent me on a quest for a comparable modern programming environment, one that would also support BP compositions. I’m pleased to report that I’ve found such a platform in a program called Sonic Pi. Originally written for the Raspberry Pi miniature computer, the program is now also available for Mac OS X and Windows. My first quick attempt at producing BP tones was incredibly easy. I’m very excited at the possibilities here. Here is a screen shot of the program, followed by an MP3 of the sounds it produced.